This path is shown as “the Green Path” on the 1775 Mouzon map, and as “Greens Path” on the 1770 Collet map. Although NCpedia suggests that it was named for a “John Green” in the early 18th century (1), former Tidewater journalist and historian, Parke Rouse, Jr., wrote: It was named for the Reverend Roger Green of Nansemond County, who successfully Petitioned the Virginia Assembly in 1653 for nearly 11,000 acres of land below the Roanoke River for the first 100 settlers who would claim them. The route [likely an Indian trading path] Green’s settlers followed south became “Green’s Path” (2). No corresponding path is shown on the 1733 map of North Carolina by Edward Moseley. However, Green’s Path was apparently in existence by the time of the Tuscarora War in the early 18th Century. In a 1942 issue of the Smithfield Herald (3), James P. Smith wrote: No history of North Carolina has been found which mentions Green or Green’s Path. The earliest mention is in the annals of the Indian Wars of 1711, when Colonel Barnwell led his South Carolina men on Green’s Path in that year to assist North Carolina in fighting the treacherous Tuscarora Indians. A reasonable assumption would be that the Green’s Path name was well established by the time Barnwell used it in his report. Unfortunately, internet searching from the comfort of home has failed to turn up a transcription of Barnwell’s report in which he refers specifically to “Green’s Path” (4). If anyone out there has that information or can point to it on the World Wide Web, please kindly share with us via the “What’s on your mind?” box below. Where is Green’s Path today? According to the NCpedia: None of the original route of Green’s Path appears to have survived in the state’s modern road system. 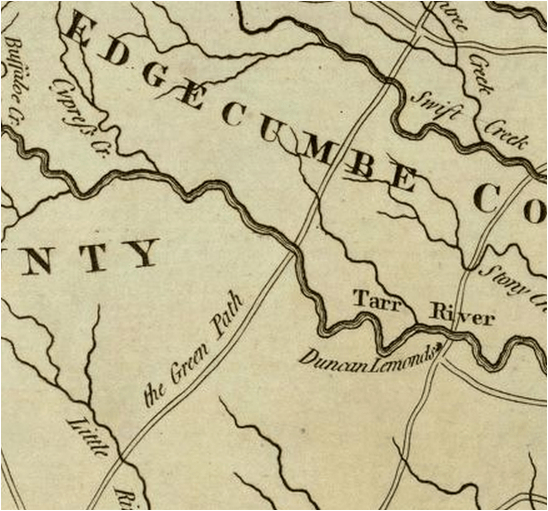 Even by 1808, the Price-Strother map of North Carolina showed unnamed roads that, at best, represent only segmental remnants of Green’s Path. As depicted on the Collet and Mouzon maps, the general course of Green’s Path was similar, but definitely not identical in location, to our present Interstate 95. The latter is the antithesis of a green way. (1) NCpedia article on Green’s Path. (4) A text search of John Barnwell’s Journal, or at least that portion of it published in the April and July issues of the Virginia Historical Magazine (aka The Virginia Magazine of History and Biography), as reproduced on http://archive.org and also on ECU’s Nooherooka web site, failed to show any matches for “green” or “path”. C. Christopher Crittenden, “Overland Travel and Transportation in North Carolina, 1763-1789,” NCHR 8 (July 1931), http://digital.ncdcr.gov/cdm/ref/collection/p16062coll9/id/4207 In right hand column of thumbnails, scroll all the way down to July 1931. This is a very interesting article, with many quotes from contemporary travel accounts, but no mention of Green’s Path by name. This entry was posted in 16 & 17th Century, 18th Century, NC Transportation, What's in a name? and tagged Colonel John Barnwell, Green Path, Green's Path, trading path by crmaps. Bookmark the permalink.